Nothing is more important than the safety of our community, and part of our commitment to safety is providing world class tools to allow you to choose what to share. Strava is special in that you can record activities anywhere in the world and connect with athletes along the way. I’ve met numerous athletes who’ve shared their favorite local routes or even met up to show me how to navigate the busy streets of Barcelona. I’ve found myself exploring places like New York and London on my own and it would be silly to say I didn’t worry at times about my safety or just didn’t want to publicly share my start location. Even in my own San Francisco backyard, I’m mindful of how I share my activities. What gives me comfort is knowing that I can control what I share on Strava and that our team has built the tools necessary for you to do the same. Nothing is more important than the safety of our community, and part of our commitment to safety is providing world class tools to allow you to choose what to share. We have a dedicated cross-functional group of employees who meet regularly to explore ways to improve privacy on Strava and our team works hard to make it easy for you to manage your privacy settings on both our mobile app and website. You can customize the information you share and find the balance between being social and being private that feels just right to you. In fact, that’s how we developed the idea that eventually became Beacon. When Premium members turn on Beacon before an activity, up to three safety contacts are able to see their location on a map in real- time. The spark for Beacon came directly from feedback from our community. Our team turned that feedback into this awesome feature to provide safer activities for athletes and peace of mind for friends and family. I use Beacon on my commute home almost every night to let my boyfriend know I’m on my way home. It gives me the comfort knowing he has an eye on my location if anything were to go wrong. I also ride and run a lot on my own both in San Francisco and when I’m traveling, most recently to London and New York and it’s nice to be able to share my whereabouts with a friend. Whether you are concerned about someone knowing where you are, where you ran or where you live, we’ve got the tools to help you take control. We work hard to make it easy for athletes to have access to the information and tools they need to control their privacy whether you’re using our mobile app or a GPS device. That’s why we don’t just have one level of privacy. We have multiple levels so that you can customize the information you share to find the balance between being social and being private that feels right to you. Here are some of the things you can do to proactively manage your privacy on Strava. The basic level is to choose to not use any privacy controls and make your info available publicly, like it would be on Twitter, for example. If you prefer a higher level of privacy, you can choose enhanced privacy to add additional controls. Enabling Enhanced Privacy allows you to manage who can follow you and see certain profile details. You can learn more here. Finally, we have our highest level of privacy. If you choose to make activities private by default or on an individual basis, you will be the only person who can see this activity on Strava. We provide this option because we know that some athletes prefer to be in single-player mode and to keep activities private. You can learn more about making your activities private here. A privacy zone will hide the portion of your activity that starts or ends in your zone from all athletes. For example, if you don’t want anyone to know where you live or work, you can set up a privacy zone between ⅛ and ⅝ mile (200m-1km) around your home address or your office address. This means that even if you accept someone’s follow request, they wouldn’t be able to pinpoint the start or endpoint of your activity. Learn more here. Flyby is a Strava Labs tool that lets you playback your activity, as well as those near you, on a map and timeline. If you do not want other athletes to see your activities that appear in Flybys, you can choose to opt-out of this feature entirely. You can opt-out by checking the “nobody” button located in the Flyby section. Social features are part of what makes Strava a motivating, fun and engaging experience. 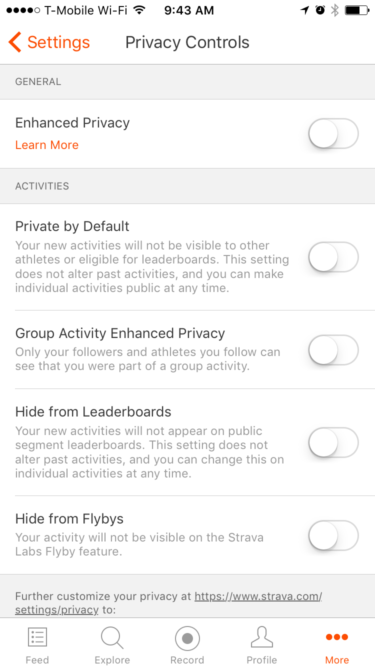 When you run or ride with other Strava athletes, we automatically group your activities together. Use this feature to ensure only you and those in your network see you were part of a group activity. Go hereto get more details. Activities with this setting enabled will not appear on public segment leaderboards. This setting does not alter past activities. You can apply this setting so all new uploads use this setting or you can use it on an individual activity basis. Much like a private activity, the segment efforts from your activity will still show up on the “My Results” leaderboard, but not on “All Time” or other public ones.If you’ve chosen to join a challenge, your activities will appear on public challenge leaderboards. You can avoid this by not participating in challenges. The Training Log collects all your training in one place and is visualized to show your progress and highlight important stats. 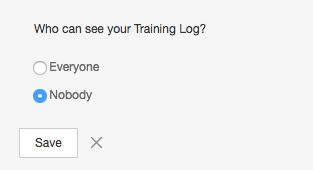 You can choose to make your training log public from your Strava settings page or from the Training Log page. From your profile page, you can easily manage your current followers from the “Following” tab. Get more details here. When you block an athlete, it stops him/her from following you again, seeing certain Profile details, or accessing your activities. You will be removed from his/her list of followers and Activity Feed. Someone you’ve blocked will be able to see your activity entries in public areas like segment leaderboards, club feeds, and segment explore. You can opt-out of contributing your anonymized public activity data to Strava Metro and the Heatmap by unchecking the box in this section. You can read more about the benefits of contributing your data here. Accessing your privacy settings is simple. On the web, you click ‘settings’ in the dropdown under your avatar then select ‘privacy’ in the menu on the left of the screen. 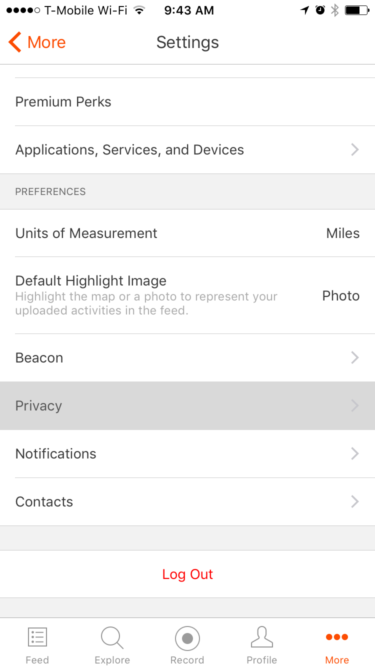 On mobile, you can find your privacy settings by tapping ‘More’ from the menu at the bottom of the screen and then ‘Settings’ and ‘Privacy’. At Strava, we’re constantly working to innovate and improve the experience for all athletes. When I finish a run, ride or other adventure and choose to share it on Strava, I feel good knowing that I can choose how that information gets shared. And I hope you do, too. 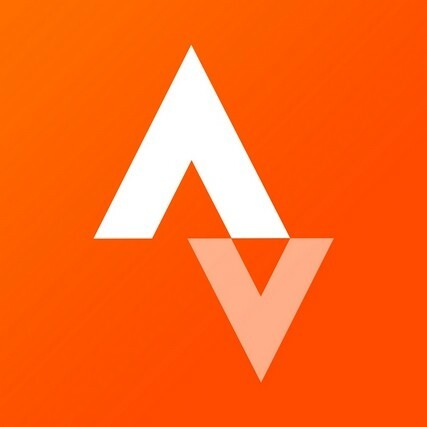 We value your feedback and are deeply committed to the safety and privacy of Strava athletes, and we thank you for being part of what makes our community great.